The Isle of Jura fell race is recognised as one of the most spectacular and demanding events in the fell racing calendar. At 17 miles over steep technical terrain and 2370m (~7800ft) ascent, a time of sub-4hrs is the barely attainable target for all but the fastest. Starting outside the Jura Distillery in Craighouse, the race climbs steadily over boggy ground to the first of its 7 summits after 3 miles. Peaks 1 to 3 are a fun warm-up, with tussocky grass and exposed rock for interest. Views over neighbouring island Islay and the Paps of Jura are stunning. The sharp drop off the side of summit 3 comes as a shock to those without serious downhill legs, and serves as a warning as what is to come; I lost several places here. 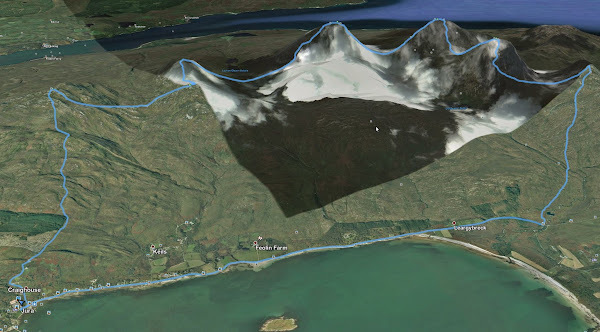 The 3 Paps of Jura (Beinn a' Chaolais 733m, Beinn an Oir 785m, Beinn Shiantaidh 757m) are the highest points of the race and should come with a health warning. The stream running into Abhain Gleann Astaile between summits 3 and 4 provides a welcome chance to top-up with water - there's no more water until after summit 6. First Pap, Beinn a' Chaolais, is approached direct heading north straight up the small stream feeding the burn below. It is steep but mostly a visible trod crossing patches of scree on the upper slopes. Taking a moment at the top to catch breath and thank the marshals, the view is fantastic, but a hard, potentially dangerous, descent is to come. A path on a narrow spur heads east-northeast from the summit to avoid a large crag due north. The exact route to the low ridge leading to the next Pap depends on how bold you are feeling; a semi-controlled fall/slide/run down the edge of a fine scree-slope seemed popular. It was hairy in places and the Mountain Rescue's presence watching from below only partial reassurance! Another hearty climb follows a direct line up the side of Pap 2, Beinn an Oir, with exposed crag and grass turning into scree, then large technical rock blocks towards the summit. I gain places on the ascent, in full knowledge that they will pass me again on the descent. There are familiar faces emerging now and the strong climbers, strong descenders, and all-rounders exchange places as the terrain changes. Fatigue is taking its toll by the time I make it to the third Pap, Benn Shiantaidh. The climb is a blur, but the descent remains stark in my memory. Chunky scree, too large to run on, an exercise in rock-hopping that demands too much of tired legs. It's excruciating, and frustrating as I see several other runners cruise by just 10-20 metres away on different lines. Apparently there is strip of green amongst the scree if you can find it - I didn't! Eventually making it down to the lochans between the 6th and 7th peaks, I refilled with water, then pushed on up the smaller climb to the summit of Corra Beinn. No more climbing from this point! But still another 5-6 miles to go. The descent to the Corran River and road bridge is relatively easy, just a few bogs to trap the unwary. Supporters are waiting at the bridge, some runners change into road shoes, though I'm not convinced it's worth it, definitely not in terms of time, possibly to hedge the risk of cramp from road running in fell shoes. The final ~3 miles along the flat road to Craighouse are beautiful, the sun is shining, but it feels like a long way. The Jura Distillery and finish sign are a very welcome sight indeed!